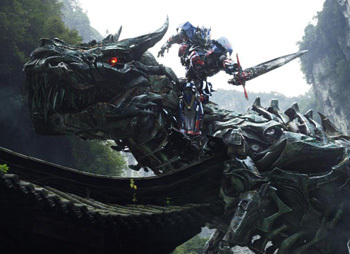 Paramount Pictures has debuted another TV spot for the upcoming Transformers: Age of Extinction and it features quite a bit of new footage from the upcoming sequel. Check it out in the player below! Opening in theaters on June 27, Transformers: Age of Extinction is the fourth film in director Michael Bay’s global blockbuster franchise. Mark Wahlberg, Stanley Tucci, Li Bingbing, Kelsey Grammer, Sophia Myles, T. J. Miller, Nicola Peltz, Jack Reynor and Titus Welliver star.